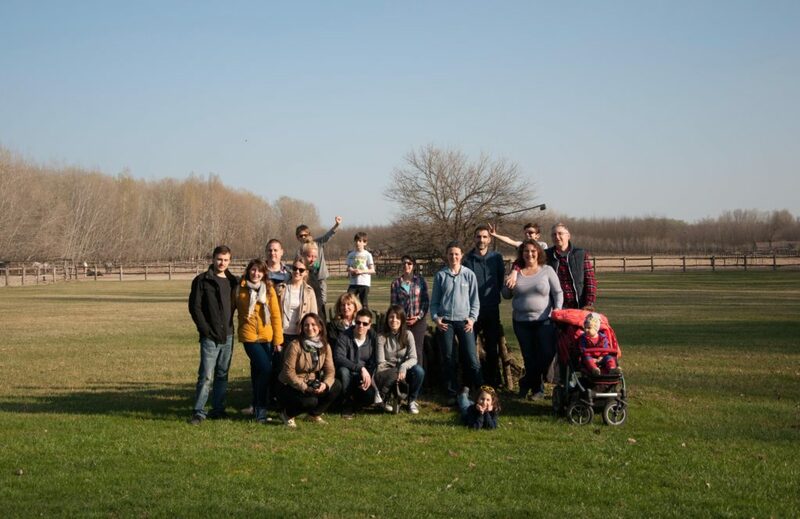 The sunny weather prompted us to head outside, and we chose a Saturday to visit the Puszta (the Pannonian steppe) with the whole QTH team, along with our husbands, partners and kids. We would like to share a few details of our trip so you can get a glimpse of what to expect from an excursion like that. 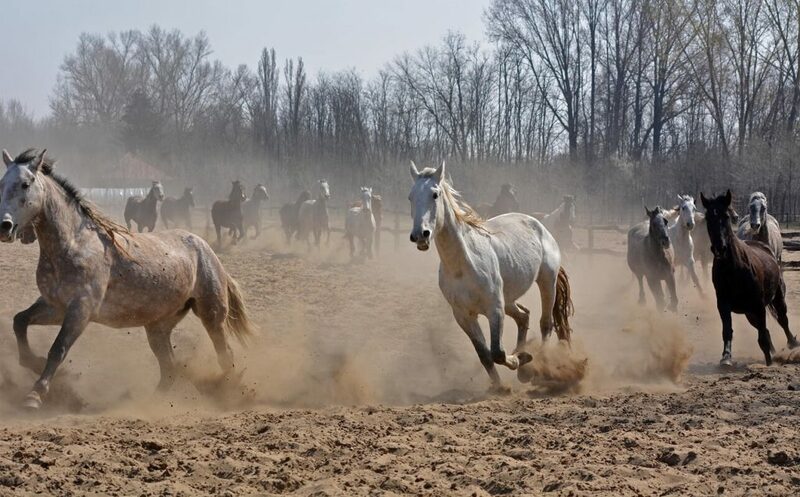 Our jolly team was greeted in the outskirts of Lajosmizse - around 70 kms from Budapest - by a csikós (a mounted horse-herdsman) who led us to the Tanyacsárda Restaurant, Programme Centre, Horse Farm and Guest House where we were offered fresh, hot "pogácsa" (a type of bread) and pálinka. After the warm welcome, we were taken around the estate on a horse-drawn carriage. Riding on a coach is a classic Hungarian activity, and most of the words for ‘coach’ in European languages derive from the Hungarian word "kocsi", literally meaning "of [the post town of] Kocs". It was so soothing to jounce along the dirt roads far from the cacophony of the city, accompanied by birdsong. 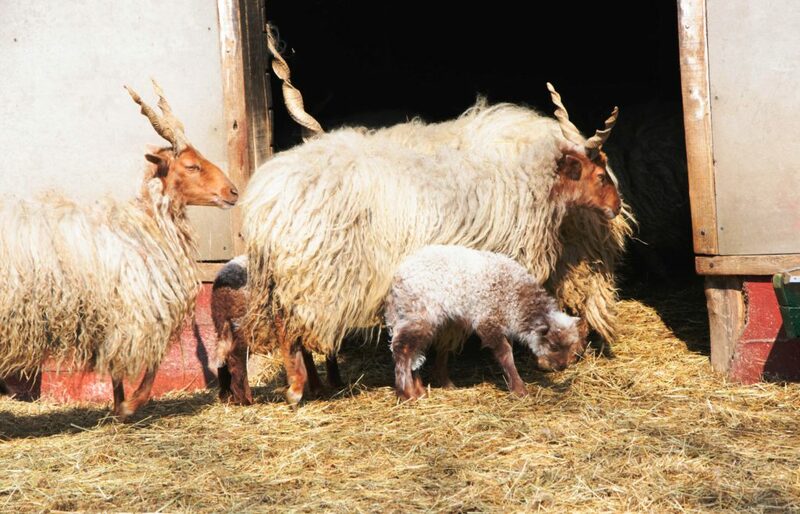 Having arrived back at the farm, we took a look at the animals around, pigs, cows, hens, ducks and rabbits. 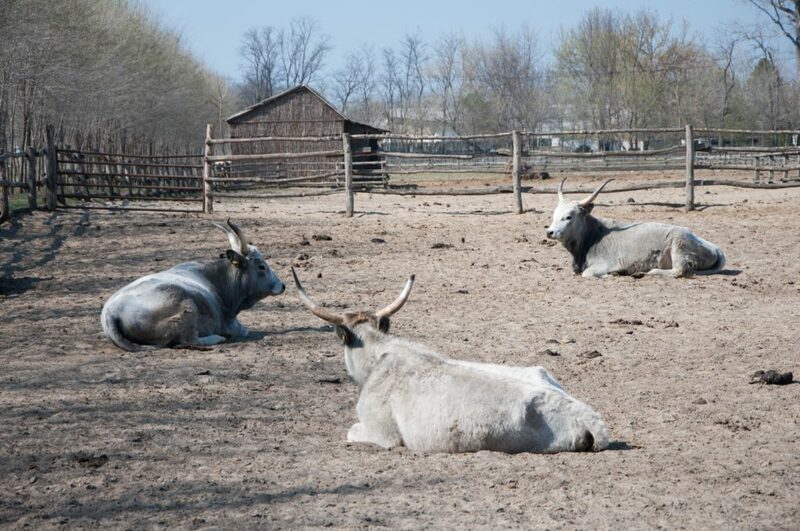 Among all the animals of the Puszta, our favourite were the Hungarian Grey cattle with their guileless charm, the racka sheep known for their unusual spiral-shaped horns, and the Lipizzan and half-bred Hungarian horses, a few of which we even took out for a spin. It was breathtaking to watch a herd of so beautiful animals galloping around the pen. 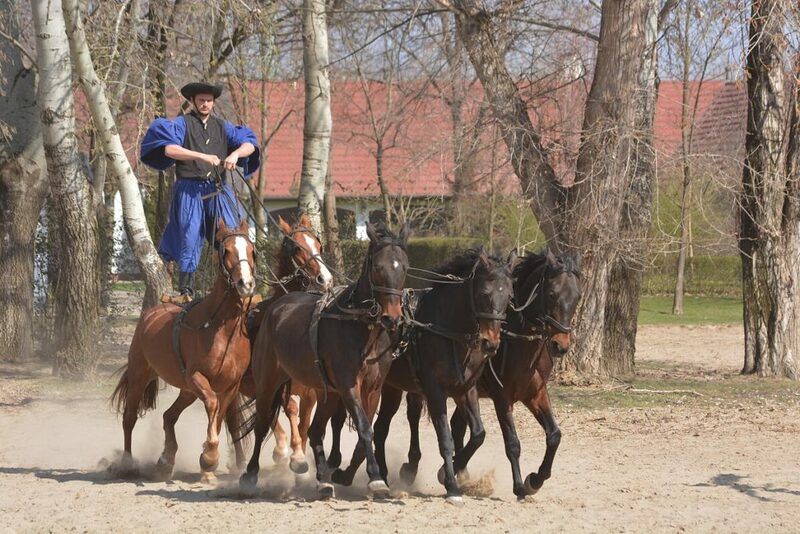 We were entertained by a show that included various staggering displays such as obstacle driving, laying down horses, training donkeys, a csikós competition, and the world-famous "Puszta Five", where a csikós uses only the rein to ride five horses simultaneously, standing on the backs of the rear two. Following a quick demonstration, we tried whipcracking using the famous Hungarian bullwhip, and even managed to win a few bottles of wine in a game. After the exciting activities, we all sat down at a well-spread table with a good appetite for a multi-course lunch. All the dishes were tasty and hearty, but our highlights would be the perfectly spicy "gulyás" soup and "tejespite" (milk pie) served with local apricot "lekvár" (a very thick jam of pure ripe fruit). Pleasantly stuffed and tired, we headed back to Pest after lunch in a really good mood. We are speaking from personal experience when we recommend Tanyacsárda for all of you. 2018 has been a very busy year for us, but we are not going to stop here! As our agency is turning 20 this year, we are preparing even more exciting things for 2019. The exciting history of our agency started in 1999 when a group of experienced tourism professionals founded the travel and event management agency Quality Tours Hungary (QTH). Due to the overlap in ownership, for many years we worked as partner agencies with Pannonia Tourist Service, a company highly regarded for its work as a strategic partner of the Accor-Pannonia group. We had more and more successful projects, and our team grew bigger. In 2015, PTS merged into its partner company. As the only successor in title, QTH constantly strives to maintain the professional standards of its esteemed predecessor. Despite travel arrangements being the focus of our business, we also put special emphasis on meeting the demands of our Hungarian clientele. To address the needs of the domestic MICE industry, we created the Quality Events brand in 2016, and separated it from the inbound tourism segment. A new development in 2018 was the acquisition of Cosmos DMC (founded in 1991) that proved to be a great way to bring fresh ideas and exciting expertise to our agency. We believe that hard work pays off. Despite the structural changes, our company is growing steadily, the number of our partners increases year by year, and we have the opportunity to show the diverse scenery and exciting culture of our magnificent country to more and more groups. We are proud to hold the title of a certified destination management company, to be one of the key partners of the Hungarian Tourism Agency, to represent our country in Europe’s greatest trade fairs, and to receive constant positive feedback from our domestic as well as our international partners. Our aim is to meet the demands of our customers, partners and guests from all around the world, and to provide the highest quality in personalized travel services.